Däck, färdiglimmade, Gladiator SC 2.2'/3.0' M2 (Medium) Tires Mounted on Renegade Black Wheels for Slash Rear, Slash 4x4, SCRT10 and Blitz Front or Rear, 1 par. This is Pro-Lines Gladiator SC 2.2'/3.0' Tires Mounted on Renegade Black Wheels (2) for Slash® Rear, Slash® 4x4 Front or Rear and Blitz Front or Rear. The Gladiator tread is an icon in the world of RC because of its unmatched traction and durability on a variety of surfaces. For over a decade, Gladiator tires have been tearing up bash and race spots around the World. 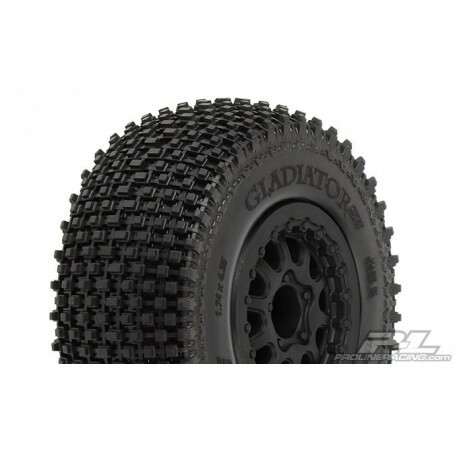 Now, Pro-Line Racing is bringing the Gladiator tread to your Short Course Truck so you can dominate the terrain! The Gladiator tires are designed to give your short course truck optimal traction on any surface, while also giving you the durability that you are searching for. Pro-Line with your traction needs. After you punch the throttle, you will be a Pro-Line fan for life! [F/R] HPI Blitz Front needs modification.